Does your "natural" hair care hide these problem ingredients? Putting chemicals on your skin or scalp, such as getting a hair dye, may actually be worse than eating them. When you eat something, the enzymes in your saliva and stomach help to break it down and flush it out of your body. However, when you put these chemicals on your skin, they are absorbed straight into your bloodstream without filtering of any kind, going directly to your delicate organs. Now I just wash, comb, and go! I used to have to wash [my hair] every day to keep it looking clean and use several styling products to tame all the frizz and to define my waves. Now I just wash, comb, and go and when it’s completely dry, it’s gorgeous! I’ve even been able to skip washing my hair and still wear it down… unheard of for me in the past! I purchased Diamond Crystal Mist the last time you gave it a shoutout and absolutely love it! I deal with extreme frizzy-ness during summertime and this has been a staple! Avoid foaming agents. Sudsing shampoos strip the hair of the scalp’s moisturizing, protective oils. A gentle approach cleanses without stripping the hair. Avoid toxins. All of the ingredients in MM products are safe enough to eat. Use a pH balanced approach. MM shampoos match the pH of the scalp, supporting balanced oil production for healthy hair. Minimize heat styling. The MM routine includes boar bristle brushing for shiny, smooth hair without heat. Color without toxins. Henna and plant extracts deep condition, highlight, and color hair without the carcinogens in other hair dyes. My hair was shiny, thick, and bouncey with no styling and no products. After a week of au natural hair care with Morrocco Method, my hair was shiny, thick (not stripped), and bouncey with no styling and no products. I just finger-combed after washing (to avoid breakage with the comb), let it air dry, and then just brush it out good with the boars hair brush. My hair loved the clay hair mask, and it really did help speed the detox period up. Thank you for recommending it! No more heat styling. No more frizz. Bed head looks like I actually spent time on my hair! Cleanse using the gentle botanical surfactants in Morrocco Method’s shampoo. Stimulate growth with the scalp massager. Moisturize and restore with the luxurious Diamond Crystal Mist. 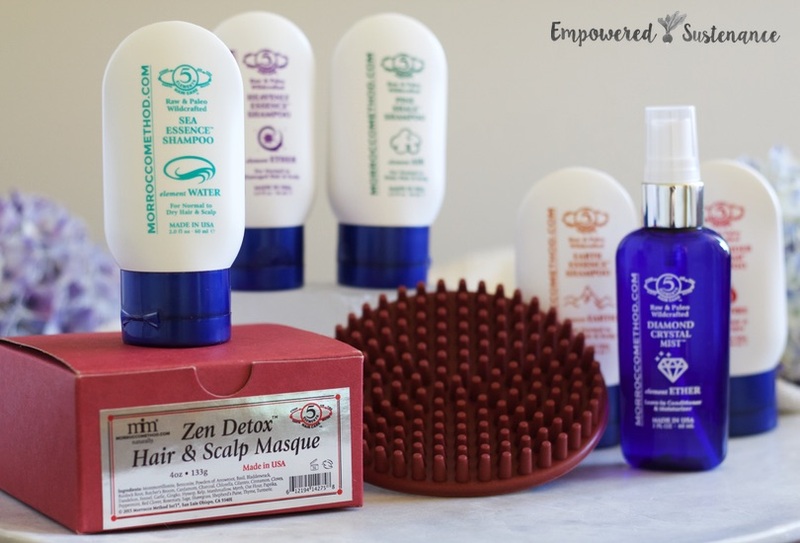 I put together the exclusive Empower Your Hair Kit so you save 30% on these holistic hair care essentials.